The change in work culture around the world has resulted in the fast growth of women in professional fields. Women are capable and wise. They are ambitious and have made their mark in all the fields. There are countless women today in all those fields that were once dominated by just men. But being a winner in a male dominated world is really not easy. If there are many women entrepreneurs who are successful and wealthy, it is because they have made compromises, alter lifestyle and worked towards their goal to achieve success. The following mentioned are a few characteristics of an entrepreneur and entrepreneurial skills that help successful women turn to best entrepreneurs. Traditionally, women are regarded as great homemakers. While men have always shouldered the responsibility of earning money to sustain the family, women are the ones who manage the funds. They naturally have good negotiation and bargaining skills that help them acquire the products at a much cheaper rate. 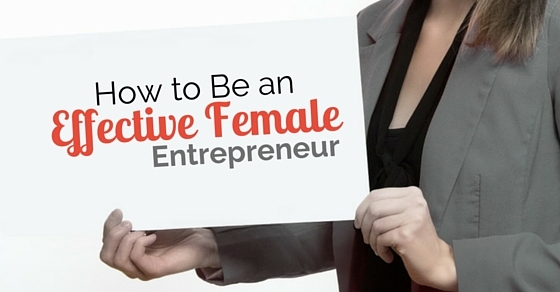 This is a quality that is sure to help the female entrepreneur. During a business, there are instances when you have to negotiate with clients or partners. Negotiating skills can help you make the best out of the business opportunities. Make sure you cherish these skills and nurture them if you wish to succeed. Women are often regarded as emotional beings. They are easily carried away by feelings like anger, pain, sorrow, excitement, happiness and enthusiasm. These feelings may lead you to sometimes take wrong decisions in business. That is why it is said that female entrepreneurs need to have their head in place. In business, you may come across people who exploit you my misusing your trust or exploiting your emotions. To avoid such exploitation, it is vital that female entrepreneur remain shrewd and have a balanced and thoughtful mind. The right decisions are always a result of a thoughtful and strong mind. A business does not run just with knowledge and ideas. You need to know what people need or want. There are certain trends that hit the market and people are often easily governed by these market trends. Understanding what is in vogue is the first step to being an entrepreneur. A good entrepreneur knows what products sell like hot cakes and why. Understanding the reason why the product sells helps business entrepreneurs come up with new and popular products. Good female entrepreneurs subscribe for newsletters and classified in the niche industry. These help them keep track of the latest trends and prepare their business strategies accordingly. There are many fields that have been male-dominated and the entry of a woman into such fields may not always be encouraged. There are chances that the established male entrepreneurs may place hurdles to hamper the progress of your new business ideas. Do not let these small stepping stones dampen your spirit. In fact, great entrepreneurs are women who are prepared for all such challenges. These tiny roadblocks do not demotivate them. They work hard and achieve their goals in spite of the challenges that are posted. Women who are biased, jealous or easily carried away by emotions, do not succeed much in their careers. Women are also known to be biased to other female employees; causing hurdles in their growth. This is often termed as ‘Queen Bee Syndrome’ and regarded as a negative trait that many female employees possess. If you do not let a deserving female employee progress, it will hamper your reputation and finally act against you during your future endeavors. People will enjoy working for you only when they feel you are impartial, unbiased and know exactly how to do business. Keep this fact in mind and do not let your emotions hamper your reputation. The initial excitement of starting your own venture fades away soon. If you do not have a proper plan or strategy in mind, you are going to waste a lot of money chasing and reaching nowhere. On the contrary, most successful female entrepreneur or businesswomen are those who have the plan in place even before they go ahead with the execution process. While you are making your business plans, have your budget and your resources properly stated. You need to know the target or goal that you wish to achieve in a set time period. Try and find out the number of man-hours that need to be put in to achieve these goals. Once everything is properly planned, approaching clients and trying to achieve your business goals will become really easy. There are many startups that come up each day but few of them even make it to the turn of the next year. The reason is extremely simple. It is because their only goal was profit and never the quality of the product or the service. You must remember that what attracts clients or customers and keeps them sticking to your firm is the quality of your service or products. If you do not provide quality service, your customers will soon find better alternatives. On the contrary, if you focus on the customer’s needs and alter your services to suit them; you will surely make profits in the long run. You must make sure that you do not compromise on quality simply to save a few dollars. The small sum that you invest in quality is sure to yield you consistent and multiple returns. When you are starting a business, you must think about what new thing are you giving your customers or clients? You must know that there are several competitors who ensure the same products at much-reduced rates and identify what is your unique selling point that distinguishes you from the rest in the field. You need to think in terms of client’s convenience or needs. For instance, there may be countless restaurants that offer food but few that allow you to customize your order. Creating a unique selling point and trading on it ensures best results. Women at higher positions are known to get easily carried away by their women power. Once they reach higher positions, they get offended easily when someone points out their mistakes. This is really a wrong approach. You need to be thankful to people who point out mistakes because they help you correct and improvise your service to take it to the next level. If you have made a mistake, be courteous to accept it. You are a human and there is every chance that you may make a mistake. It is not wrong to make a mistake but it is a crime to go ahead with the same even when someone provides suggestions to correct it. You must always keep in mind that clients are the ones who ensure your business growth. Thus, a good and cordial relationship with the client is a major ingredient to your success recipe. Make sure you maintain good relationships with your client. This means that you need to stay in touch with your client. It is a great idea to wish them on occasions to strengthen your professional relationship. If you have any misunderstanding, always speak to the client’s face to face to clear the misunderstanding. Government has stipulated certain rules and guidelines that need to be followed in any business. These guidelines are stated for the safety of the users and the welfare of the society. It is always in the best interest of young and aspiring female entrepreneur to abide by the laws set by the government. You need to have all the documents in place before you start your venture. Make sure you have fulfilled the tax filing requirements. You also need to make sure your company is properly registered. Remember that even the best service does not attract customers till they know about it. That is the reason why many businesswomen spend a lot of money on branding. You need to have a well-set branding strategy so that your brand reaches the masses. The advancement of internet and the ease of internet access to everyone have made social media a very important platform. It is necessary that you spend equally on branding on different social platforms like Facebook, Twitter and Whatsapp. These are the simplest ways to draw the public to your website or brand. While there are ample challenges on the road to becoming a female entrepreneur, there are many benefits too. Government provides special funding to female entrepreneurs to encourage them. So make the best use of these facilities and achieve your goals.